Home-made breads, flavoured salts, pates, sausages, butters, a great wine list, signature cocktails and great selection of teas and infusions. 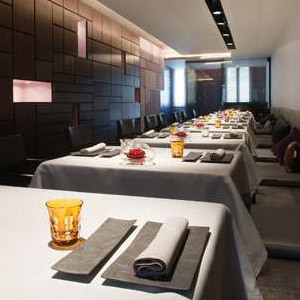 This restaurant is home to a cocktail bar, a modern dining room and a unusual private room situated right by the kitchen. The chef's unique style and technical expertise are apparent in the delicate, perfectly balanced dishes on the menu. Chef: Sergi Arola worked 8 years at el Bulli with Ferran Adria, he then open his own restaurant, La Broche, and obtained two Michelin stars. After that he opened Gastro and won another two Michelin Stars. Awards: 2 Michelin Stars. Chef Sergi Arola won Spain Champion Cuisine Contest 1996, Au Cheff del Avenir 1998, National Gastronomy Prize 2002, Chef of the Year Award Gourmet Club 2003, Award for best pastry restaurant Gourmet Magazine, Award "Elle" the best chef in 2000, Metropolis Award for the Chef of the Year 2004.